The old cliche about ants being attracted to a picnic is based in truth: ants are attracted to ample supplies of food and water. Strawberry beds provide both resources. Some ant species burrow into the strawberries for food, and may even build their colonies in a strawberry bed where the soil receives an ample supply of water. An ant colony may have more than one queen and over 250,000 workers in the case of fire ant colonies. Getting rid of an ant colony requires careful planning. Follow the ants back to their colonies. Most ant colonies will have some kind of ant hill as a marker. Fire ant colonies may have mounds that are several feet high and resemble a berm of earth. Heat a pot containing at least three gallons of water to boiling. Pour the water directly onto a mound of ants. This method works best if you time it for a point when the colony is near the surface of the soil, such as just after a rainstorm or on a cool, sunny morning. If the ant colony’s queen is not killed in this boiling deluge, the colony will survive. According to NC State University, this method is effective 60 percent of the time. Determine the size of your ant mound. Some ant mounds are very small, but fire ant mounds may reach several feet in diameter. Mix a liquid formula containing an insecticide such as Dursban, Diazinon or Sevin and water in a bucket. Use the amount of insecticide recommended on the brand’s packaging. Typical mixes include 1 to 2 tbsp. of insecticide per gallon of water. Pour the liquid formula over the mound and the ground in a 3-foot radius to cut off any side passage routes that ants can escape from. Use one gallon per every 6 inches of mound diameter. Drench treatments are most effective during sunny weather when the temperature is below 90 degrees. Pour a barrier of powdered charcoal or bone meal around your strawberry plants. Ants will not cross these barriers. According to the University of Florida, some attempts to eliminate an ant colony will cause the colony to divide in two and will make your problem worse. 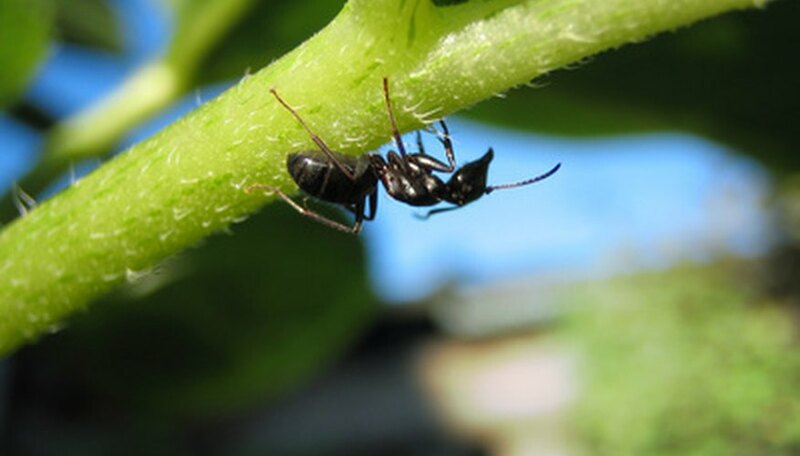 To avoid this, the University of Florida Integrated Pest Management department recommends that you hire a professional pest exterminator to eliminate ants from your garden.